'We Start with the World and How To Transform It' - Report from First Equatorial Guinea Book Fair - Atlanta, San Francisco, Twin Cities, New York. Rescuers carry miner Feng Yin out of Dongfeng coal mine November 28, after he was trapped by explosion the previous day near the city of Qitaihe in northeast China. Some 221 miners were working underground when the blast went off. At least 146 miners died in Chinas second-worst mine disaster this year after coal dust caught fire, setting off a massive explosion November 27 at the Dongfeng coal mine in Qitaihe, a northeastern city. 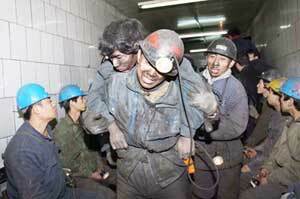 A total of 72 miners have been rescued, Chinas state news agency Xinhua reported. The blast knocked out the ventilation system and poisonous gas filled the mine, making survival for those trapped inside unlikely. Two days after the explosion, rescuers recovered the bodies of 12 dead miners. None have been found alive. Three miners are still missing. Meanwhile, 18 miners remain trapped since November 24 by underground flooding at the Gaocun mine in Hebei province in northern China. Bosses along with some technicians fled the scene and abandoned these miners to their fate, leaving rescue teams without a guide to the mine, Xinhua said. Rescuers say the miners may still be alive. According to Chinese government statistics, 2,337 accidents occurred in the countrys coal mines in the first nine months of this year, resulting in 4,228 deaths. This is slightly higher than the 4,135 deaths reported in the same period last year. During 2004 a total of 6,027 people died in 3,639 coal-mining accidentsabout 400 less than the previous year. China is the worlds top producer of coal, from which it generates three-quarters of its energy. The countrys total power generation is second only to the United States. Energy demand has soared to fuel Chinas power-starved and rapidly growing industries. At the same time, authorities in Beijing have continued to open the countrys centralized economy to foreign investment and capitalist market methods. These factors fuel the drive for profit and personal gain by mine owners and government officials who cut the bosses slack at the cost of workers safety. One indication of the scope of the problem was reported by Xinhua November 1. The news agency said there are over 580,000 black lung patients, of whom 140,000 have died. Black lung is caused by coal dust. The Chinese government has taken steps recently to stem the mining fatalities by implementing new regulationssuspending production or closing mines that dont meet safety standards and cracking down on collusion between government officials and mine bosses. This includes a two-month campaign that ended October 20 to clear coal mines of shares held privately by officials in four government ministries. Chinas work safety authority has suspended production at more than 12,000 mines for safety improvements. Some 9,000 of these have been closed since January, Xinhua reported November 22. Several recent mine disasters, however, occurred at mines that had been ordered shut down for safety checks, indicating the risk mine bosses are willing to take in the drive for profit. The head of the State Administration of Coal Mine Safety, Zhao Tiechui, said November 7 that at least 4,000 mines have to be permanently closed by the end of the year. Nearly 1,900 such mines had been shut down as of November 8. Although the suspended facilities are about half of Chinas total number of mines, Reuters said the shutdowns arent expected to have much impact on the countys coal production since the vast majority are small privately owned mines, which also tend to be the most dangerous. China Youth Daily reported last month that Chinese police arrested the vice mayor of Fukang city, who was in charge of safety during an explosion at the Shenlong coal mine that killed 83 workers. The mayor had allegedly accepted about $20,000 in bribes from the company. By October 20, nearly 4,600 officials had come forward and reported they had privately invested a total of $80 million in coal mines. According to China Daily, some $56 million of this amount has been withdrawn. Those who withdrew their sharesincluding more than 3,000 civil servants and 1,500 heads of state-owned enterpriseswill be exempt from punishment, said Vice Minister of Supervision Chen Changzhi.